Save yourself time and organizing certificates for the fair. 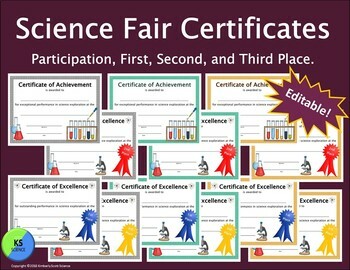 These editable certificates allow you to type in the name and name of the fair. There are 3 color versions included. Use a different color for grade levels or for different years. Brightly colored and easy to read. JPEG images included too. This is a Power Point download. Please make sure you have the program to access the files. You can rotate the colors for different years. You can also give different grade levels different colors. This will help when organizing the fair. Color coding your fair saves time and any mix-ups. I always color code the different grade levels. You can also mix-and-match the colors any way you like. Looking for more science fair products. 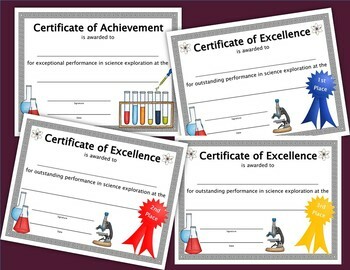 Kimberly Scott Science provides guides for students and teachers. Thank you for previewing my product. I hope it meets your needs.